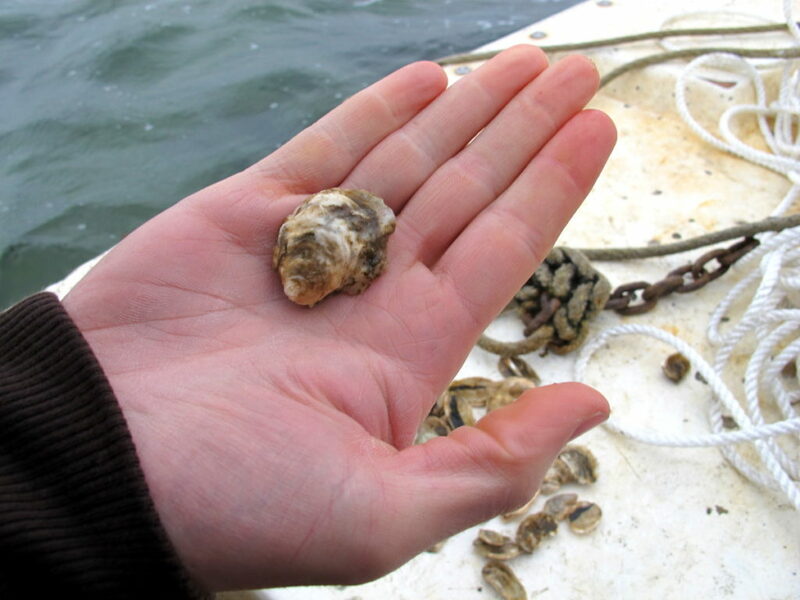 Wind to my back, oyster in hand, I was happily perched aboard a fishing boat on Narragansett Bay, on a tour with Ocean State Shellfish Coop. We would be visiting and learning from two oyster farmers today, both members of a 6-farm cooperative of independent oyster farms. Hurricane Sandy may have been approaching the next day, but we were still having a blast! 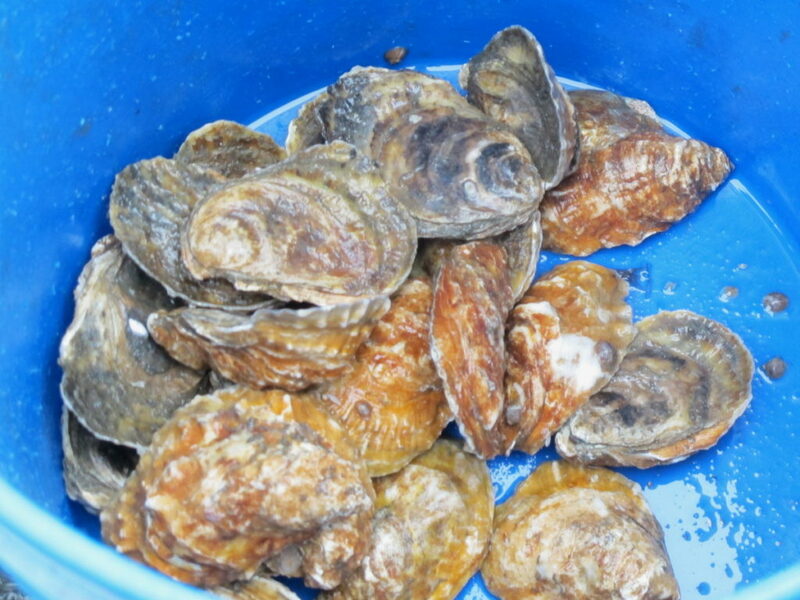 “Watch out, it’s going to be bumpy!” shouted Russ Blank, co-owner of Rome Point Oyster Farm. He steered the boat away from the dock into the bay, and I inhaled the salty air, a definite change of pace from the exhaust fumes of New York. Graham Brawley, Director of Sales and Marketing for Ocean State Shellfish Coop, was also on-board. “We’ve had some severe problems with disease in the past,” Russ continued. “SSO [shore side organism] took out almost the entire crop in the past. But this year, we’ve been experimenting with disease-resistant varieties and the oysters are doing much better.” You have to hand it to farmers—there’s no other profession that has quite the same optimism in the face of risks and devastation wrought by nature. Narragansett Bay was at high tide, and choppier than usual due to the impending storm. I struggled to keep my balance as the waves crashed over the sides. We motored our way to the Rome Point oyster lease, which borders John H. Chaffee Nature Preserve. That means there’s no houses or industrial development nearby. In this pristine sanctuary, bags of oysters quietly fatten and grow. At Rome Point, a series of colorful buoys dotted the water’s surface. Each buoy marks the location of three oyster cages, and each cage generally holds six bags of oysters. Here, the water is about 11 feet deep, and the cages are held six inches off the bottom, ensuring the oysters will not get stuck in mud. 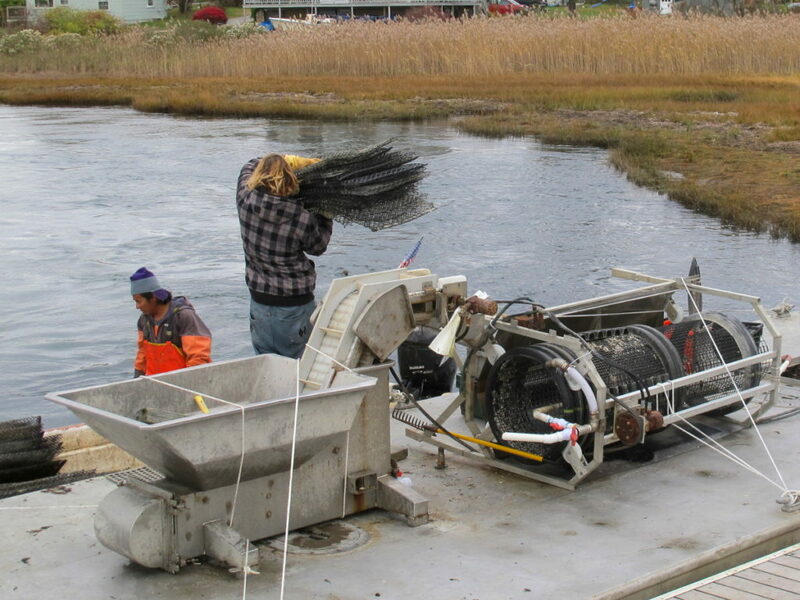 Using a hand-powered crank, Russ grabbed a buoy and lifted up the attached oyster cage. Water streamed onto deck, and a small fish was flopping around inside the cage. Graham lifted a bag out of the cage and dumped the contents into a bucket. Gleaming, vibrant oysters looked back at us, each with a neatly manicured, teardrop-shaped shell. 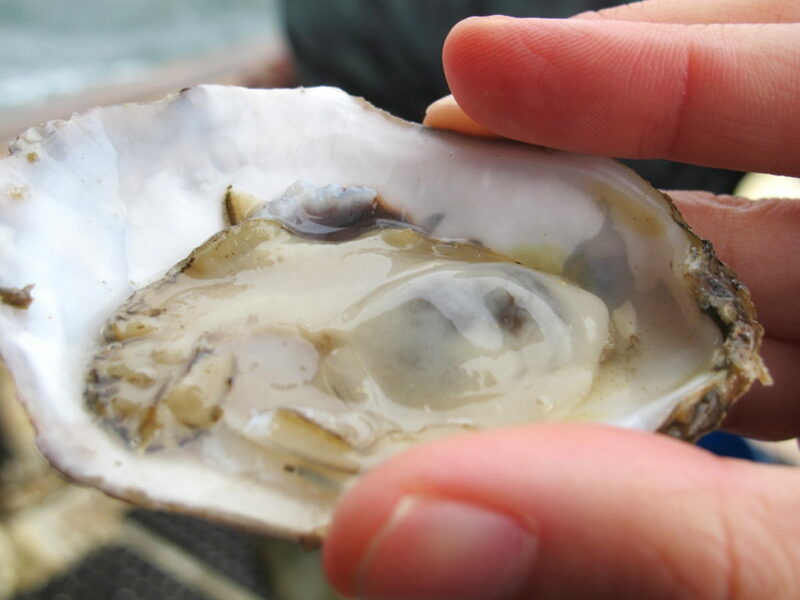 While standing on the rocking boat without a protective towel, Graham deftly shucked the oysters and passed them out. Fresh out of the water, the oysters were overflowing with briny liquor, rich with a meaty umami finish. I took a second. At Matunuck Oyster Farm, we were introduced to Perry Raso, the owner of the farm and Matunuck Oyster Bar. The oyster bar is located adjacent to the oyster lease; in fact, you can see the oyster tumblers from the restaurant’s patio as you sip your beer. As demand necessitates, oysters are pulled from the water and brought directly to the raw bar. I can’t think of a more perfect location for an oyster bar. Graham’s son, Sean, did the honors of taking us out to see the oyster site. We hopped into the boat and headed into Potter’s Pond. This saltwater pond is connected by a tiny inlet to Point Judith pond, which is connected by a small channel to Block Island Sound. 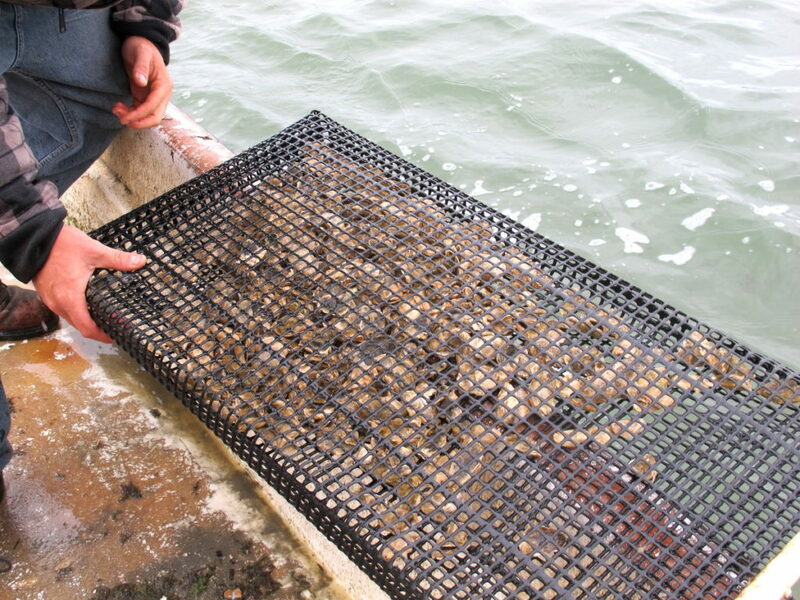 Like Rome Point, the Matunuck farm uses mesh bags to grow their oysters. However, since the water here is much shallower, they don’t use oyster cages and instead use a system of PVC pipes to attach the bags to floating lines. Sean pulled up a bag of juvenile oysters and scattered a few on the deck. “These babies are no more than 6 months old,” he said. “Naming oysters is tricky,” noted Graham. “What works for one area might not work for another. For instance, sometimes Matunuck Farm’s oysters sell well as Matunucks, and sometimes they sell better as Potter Moons.” In general though, it’s best to name the oyster after a geographic location, so that diners have a reference for where the oyster is from. With wind-tousled hair and new appetites, we headed back to Matunuck Oyster Bar for a hearty lunch of oyster stew, fish and of course, a generous platter of raw oysters and clams. 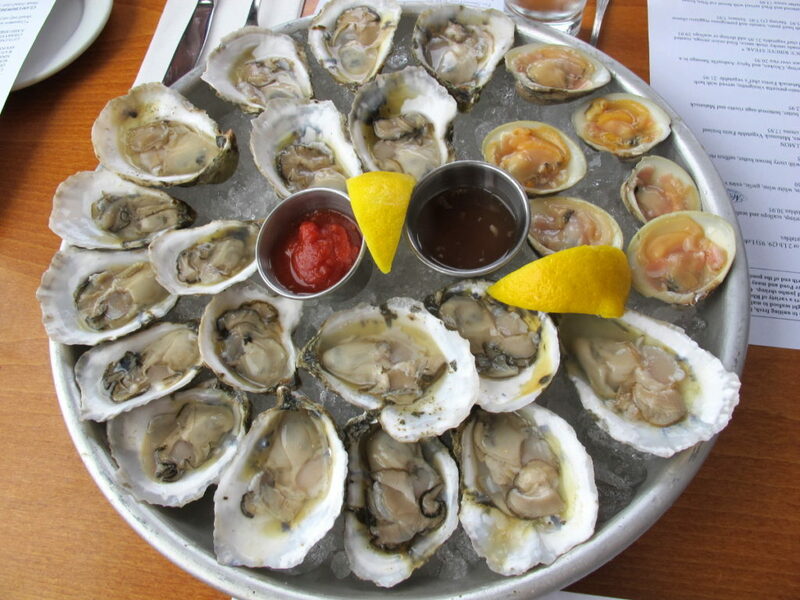 On that day, the oyster bar had Matunuck, Watch Hill and Winnepaug oysters, all freshly delivered from local farms. “You know,” said Graham, “Rhode Island has the best oysters on the planet.” We slurped our oysters in enthusiastic agreement.